The snake man® Ray Hoser, was born in the UK, but has also spent time in the USA, where he continues to do business. When not travelling, he resides in Australia. 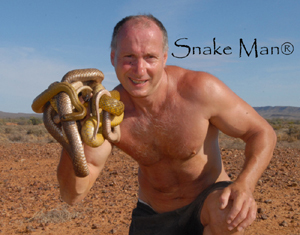 His team are are experts at making wildlife shows, TV and other kinds of education with reptiles and other animals. We also deal with wildlife capture and relocation and everything else that comes with these general lines of business. For educational wildlife displays and education, our specialty is kids wildlife themed birthday parties, educational school incursions with snakes and other interactive forms of educational display. However in the USA, greatest demand for our services is in relation to our expertise with wildlife, including the sale of books and journals and venomous snake handler training. The snake man has even named species from the USA, including two species of Alligator Snapping Turtle as well as numerous genera of snake and lizard from most parts of North America. The snake man has formally named several genera of Rattlesnake, Coral Snake, Garter Snakes and other well-known North American species of snake.